Thomas AKA The Candy Perfume Boy takes you on a journey around the fragrance world with ‘The Escentual A-Z of Fragrance’ a fun and fragrant ride that gives you all you need to know – the notes, the brands and the perfumers – to become a true fragrance addict/nerd. Throughout The Escentual A-Z of Fragrance I aim to introduce you to not only some of the greatest perfumes on this good, green Earth but also the ingredients that are used to make them so special. Perfumers have access to thousands of materials in their tool kits, some natural and some synthetic. These materials, or ‘notes’, are pieced together like a jigsaw with their matching, or contrasting facets slotted together to create both familiar and unusual smells. Out of this myriad of materials, one of my favourites and arguably one of the most delicious and comforting is benzoin. Benzoin is a balsamic resin extracted from several types of stryax tree. It is often used in perfume not only for its smell but also as a fixative to increase stability and longevity. It is also widely used in the creation of incense. 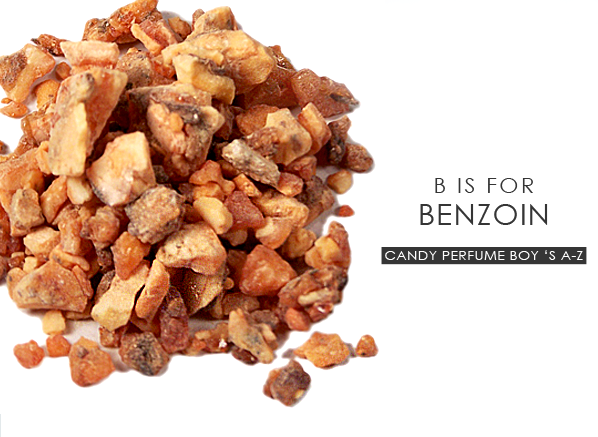 Benzoin has a sweet, cosy and comforting aroma that is similar to vanilla but has a soft, fluffy texture almost like candy floss. Perfumers often use it on its own or with vanilla and labdanum to create the addictive accord of amber. Due to its similarity to vanilla, benzoin is often used in gourmand perfumes (foody, desert-like perfumes) to amplify sweetness but the truth is that it really is a remarkably versatile ingredient that works well with many floral, woody and incense notes to accentuate their richness. Perhaps one of the most unusual uses of benzoin is in Etat Libre d’Orange’s Archives 69. Instead of being coupled with warm spices and resins the benzoin in this odd perfume is blended with cool metallic notes, berries, pepper and o-zone to create the alien smell of ice-cold animal fur. Strange and shocking, Archives 69 is a must try for those who like a challenge. Madonna’s Truth or Dare is another perfume that uses benzoin in an interesting way. Here the narcotic quality of intense white blooms is laid over a base of creamy vanilla and fuzzy benzoin, giving the impression of a full-bodied floral that smells delicious without actually being edible. The use of benzoin in Amouage’s Interlude Woman is subtler than in the other perfumes within this guide, but it goes to show how the note can add to a fragrance without taking centre stage. In Interlude Woman benzoin softens some of the perfumes’ harder edges, acting as a buffer for the chaos of kiwi, coffee, immortelle and leather. It is the key link that ensures that everything else slots in to the right place at the right time. Since teaming up with perfumer Daniela Andrier Italian fashion house Prada has released a number of perfumes containing benzoin as a central note. First used in their stunning Infusion d’Iris, the note serves to amp up the suede-like texture of the powdery iris evoking the image of a luxurious pair of gloves. This theme of luxury accessories is also carried through in to the other infusions, namely; Infusion d’Iris Eau de Parfum Absolue, a rootier, earthier version of the original and Infusion d’Homme, a sparkling and handsome masculine take on benzoin and iris. But it is with Candy that Prada ditches its training wheels and pushes its use of benzoin to the limit. Here the note is used to compliment the sticky sweetness of caramel and the velvety spice of vanilla. The result is a flirtatious fragrance that is as cosy and delicious as it is fun. Not for the serious at heart. If you’re looking for benzoin as a supporting note within the triad of notes that compose the accord of amber, then look no further than Opus VI by Amouage and Ambre Sultan by Serge Lutens. Opus VI is a thoroughly modern amber that uses deep and rich woody notes over the plushness of vanilla and dark chocolate whereas Ambre Sultan is a classic amber served straight up with herbal accents. Being at opposite ends of the amber spectrum Opus VI and Ambre Sultan serve as a reminder of the versatility of an incredibly simple accord that can be utilised in almost an infinite number of ways. M7 Oud Absolu by Yves Saint Laurent. How typical is it to have to find the most elusive fragrance on the market less than 10 days before Christmas??? Website easy to navigate, ordering simple, free P&P over £30, perfect item, securely packaged, extremely prompt delivery despite festive season. Smells wonderfully warm- but not heavy- on my other half and not too bad on me. Perfect !!! This entry was posted on Monday, February 18th, 2013 at 9:00 am and is filed under Candy Perfume Boy, Fragrance, Hints & Tips, Men, Spotlight On. You can follow any responses to this entry through the RSS 2.0 feed. You can skip to the end and leave a response. Pinging is currently not allowed. Such a delicious note & nice benzoin frag tips. – But nooooo , if y’re gonna have ‘Prada benzoins’ ya really can’t miss out on their absolute benzoin masterpiece -> Prada No9 Benjoin. Probably one of the best showcases of the note. IMO ‘nada’ beats it !